Owner of SERVPRO of Chesterfield Wildwood. He has 16 years of experience and has the following certifications from the Institute of Inspection Cleaning and Restoration Certification (IICRC): Water Removal Technician, Applied Structural Drying Technician, Carpet Cleaning Technician, Odor Control, Applied Microbial Remediation, and Fire and Smoke Restoration. 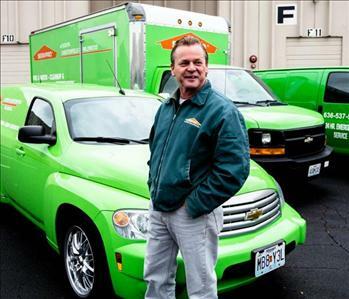 Operations Manager at SERVPRO of Chesterfield Wildwood. He has 15 years of experience and has the following certifications from the Institute of Inspection Cleaning and Restoration Certification (IICRC): Water Removal Technician, Applied Structural Drying Technician and Carpet Cleaning Technician. left to right- Tony (crew chief), Andrew (production manager), Joel (Tech), and Jerry (Tech). Our crews have several years of experience and has the following certifications from the Institute of Inspection Cleaning and Restoration Certification (IICRC): Water Removal Technician, Applied Structural Drying Technician and Carpet Cleaning Technician Fire Damage Restration. 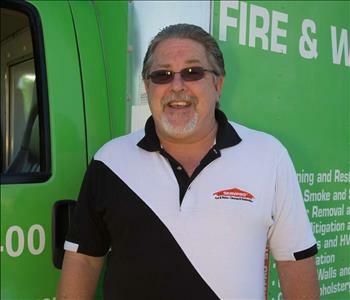 Anthony Bowman is the Production Manager at SERVPRO of Chesterfield Wildwood. He has 10 years of experience and has the following certifications from the Institute of Inspection Cleaning and Restoration Certification (IICRC): Water Removal Technician, Applied Structural Drying Technician and Carpet Cleaning Technician. Dillan is the Crew Chief at SERVPRO of S Chesterfield Wildwood. He has several years of experience and has the following certifications from the Institute of Inspection Cleaning and Restoration Certification (IICRC): Water Removal Technician, and Carpet Cleaning Technician. 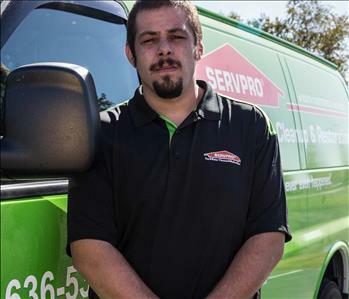 Travis Bowman is the Crew Chief at SERVPRO of S Chesterfield Wildwood. He has several years of experience and has the following certifications from the Institute of Inspection Cleaning and Restoration Certification (IICRC): Water Removal Technician, and Carpet Cleaning Technician.